This tutorial will walk you through the process of displaying hierarchical data in RadGridView. It will not cover the creation of a Silverlight application, adding RadGridView to your UserControl or how to define columns. If you need information on any of these topics please read the Getting Started topic. Assuming that you have already created a Silverlight application and defined the RadGridView control, it is time to prepare the sample data for it. The sample data is represented by teams divided into divisions. 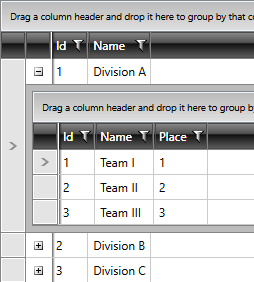 First create the class that will represent a single team. The class that represents a single division will contain a collection of Team objects. Note that if you want to support two way binding your classes should implement the INotifyPropertyChanged interface and rise the PropertyChanged event every time a property value changes. Create "DivisionsService" class and implement a static method GetDivisions. For the purpose of this tutorial it will return an observable collection containing several hard-coded divisions. Now after the sample data is prepared you are ready to bind it to the RadGridView. To do this set the ItemsSource property of the grid to the collection returned by the GetDivisions method. But first define the following columns. Set the ItemsSource in the code-behind file of your UserControl. If you run the application at this stage you should see this. The next step is to make the RadGridView display the collections of teams as children of the respective rows. To do that use the ChildTableDefinitions property of the RadGridView and define a new GridViewTableDefinition with the following relation. To learn more about the Hierarchical Grids you can visit the Hierarchical GridView section.